It is said that every site or home is surrounded by four symbolic animal spirits (as shown in the picture). Ideally these four directions should be harmonious with each other. An important consideration is that all sites or home should be sloping and well drained. The back of the house should be protected by mountains or using trees as shields behind the house. Carefully analyze the landscape for the presence of Qi (Dragon's Breath) for shapes that reveal reveal the Yang Dragon and the Yin Tiger. Examine the landscape where the dragon and the tiger meet. This is where sharply rising Yang Dragon merges softly with the undulating Yin tiger ground. The dragon is usually the dominant feature of a landscape. In a city, the dragon can be the main road, in a room it can be door or a feature wall. This is to check for intangible influences (either good or bad) affecting the home. As we saw in the introduction, Chinese believe in the existence of two opposite but equal forces - yin and yang. These maintain a balance of opposition which keeps the world active. Yin and yang are within everything even inert matter as land. When humans come to live in or develop an area, they must do so in balance with the forces already within the area, and with due regard for the heavenly influences which operate upon the landscape. 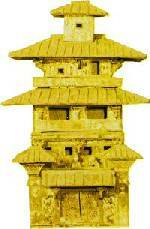 In areas with bad Feng Shui, Pagodas were erected to enhance the Feng Shui of that area. Pagodas were odd storeys high e.g. 5, 7, 9 etc. To do other than this is to disrupt the balance, to disturb adversely the yin-yang equation and ultimately to bring some form of calamity upon the heads of those who have disregarded Feng Shui. The art or science of divination the land is thus of great importance and it is this which has become known as Feng Shui (wind and water) being the two symbols for yin and yang in geomancy. In ancient China, the customary idea was to choose hills as the sites for tombs or to build tombs beside hills. All the tombs for the Emperors, Queens and concubines were called mount tombs and built at the foot of a hill. The site was chosen after close inspection of its scenic geographical and geological qualities. This was the reason why all the imperial tombs are now perfect scenic spots in the embrace of hills and valleys. The 4 SYMBOLIC ANIMAL PRINCIPLE can be applied to analyzing a landscape, site, a building, a house, an office and rooms. Principle 1: The solid tortoise or back of the house should form a `protective' barrier. Notice that for any site, building or house, the tortoise is always behind you. The tortoise is suppose to form a good backing behind and form a `protective' barrier. This is why Feng Shui Masters recommend not to have a watercourse e.g. a canal or river behind the house. Water is unpredictable and in the I-ching, it represents difficulty. Principle 2: Provide an open space at the front of the site or house. For example, the front of the house should not be too close to another building or it's view is being blocked by another building. This is represented by the bird or Phoenix flying in-front of the open space of a good site, building or house. Principle 3: It is excellent if your site has a higher building (on the left or EAST) as this represents a raised Dragon and on the right a lower tiger. Do note that on every site, there is always a Dragon on the left (EAST) and Tiger on the right (WEST). The above principles can also be applied to the interior of the house. For example, do place your bed behind a solid wall. Do not place your bed against a window as this does not provide proper `support'. If all 3 Principles are met then, can a site/building or house be considered " EXCELLENT ". What is the White Tiger? 1. To the Chinese, a white tiger is particularly `inauspicious' or considered unlucky to see a white tiger especially one is gambling. In one legend, after 500 years, a certain tiger changed it's coat of fur and turned white. This is how we now call the West side of a building or house the " White Tiger ". If you have read the Four Symbolic Animals or Four Cosmic Animals concept; one will notice that on the East is the " Green Dragon ". 2. Both the East (Green Dragon) and West (White Tiger) are often used by Feng Shui Masters to relate to Feng Shui enhancements of Qi or for feng shui cures. Logically East is the location of the rising sun and thus a Yang location. The Green Dragon is considered the most Yang of all Feng Shui animals. It is encouraged that plants can be grown here. The White is considered the most Yin of all Feng Shui animals. It is considered courageous and noble animal. It is also seen by many FS practitioners as a fierce and determined animal. 3. Under the Landscape School of Feng Shui you will usually hear that for a house, on the East (the Green Dragon) should be higher than the West (White tiger) and the two should `embrace' each other. In this `natural order' it is preferred by FS Masters that the Green Dragon should be higer than the West tiger. Eg. a building on the left side (dragon) of your building should be higher than the right (tiger's side). This is said to bring more fortune to the owner. What happens when this natural order is reversed? i.e. The West Tiger side is higher than the Green Dragon side. For the owner of the middle house for example, will become "dominated." For example, if he has a son, his son would dominate the house or if he has a mistress, he will be dominated by his mistress and she will be more the fortunate than the owner. Question: Pardon me for asking (or if I'm mistaken), but, isn't the tortoise at the N whilst the phoenix or bird is at the South? (dragon at the E and tiger at the W?). Is it a typo error? Or are these animal symbolism DYNAMIC instead of STATIC? as in Flying Star Theory? Just wanna be sure. Answer: Thanks for pointing it out. I had given lots of thought on this before making the North and South interchangeable. With this, I hope to make feng shui relevant and continuously look at easy to use templates which is the mission of Geomancy.net. Let me explain why I do this. Reason 1: To minimize or reduce errors especially for newcomers. Why an interchangeable North and South: Tortise and Phoenix? If a newcomer were to take that North is Fixed = Tortise or solid backing, and the south a Phoenix or clear space, then it would be totally wrong under Feng Shui practises. The front of the house should not have a solid backing! If you are aware, most houses especially in Northern China have their main entrance facing South and the North, mountains, hills etc.. Many homes also do not have any windows at the North. Many Feng Shui practioners in the Southern hemisphere should agree to this because it is directly opposite "down-under". Reason 2: Most of the time, for Feng Shui cures or fixes, it is important to know where the Dragon (East) and the tiger (West) is. If you have read a few of cures in this bbs, I had to relate the fierce White Tiger to the 5 elements and there was one who even had placed two lion statues (metal element) to `attack' the White Tiger, the result, it would make the White Tiger stronger. For Feng Shui cures for the Main entrance (clear space) and the Tortise back is always standard cures e.g. back must not have pool of water etc.. The cures for the North and South are quite standard as compared to the West. The East Dragon is not so bad also. Next thing is that once we always know that the back is the tortise and front (clear space) we can confidently apply it to a house, a room, an office and a site. So based on my conclusion, once a person knows the concept of the " Tortise ", the " Bird - clear space" this is easy to apply not withstanding whether it is North or South. As for the East and West, it is always `fixed' in relation a transposed North/South.